Warner’s Decking is a TrexPro Platinum Contractor. Trex® decking and railing have all the natural beauty of wood, but leave behind the rotting and splintering. Spend more time relaxing on your deck instead of working on it. What’s more, Trex products improve the look of your home, and they grow the value. And for the last 20-years, Trex has been the leader in composite decks and decking – the longest record of proven performance in the industry. At Warner’s Decking, we’re proud to represent Trex Decks and to have earned their highest distinction – TrexPro Elite and Platinum Contractor. Trex offers many different types of decking from composite to PVC. Trex is recognized as an industry-leading green proponent. Trex is the first company in the wood-alternative decking industry to receive an International Code Council Evaluation Service (ICC-ES) SAVE Verification for Recycled Content. This independent third party verification confirms that Trex composite products are as green as they get. Trex Decking and Railings systems contribute to a building’s enviable LEED points. The leadership in Energy and Environmental Design Green Building Rating System is the nationally accepted benchmark for the design, construction, and operation of high-performance green buildings. Doesn’t weaken, split, rot or splinter over time the way wood does. Immediately boosts your home’s value while enhancing its beauty. Has proven to be a key selling point for potentials homebuyers. Trex 25 Year Fade & Stain WarrantyThe Trex Transcend line has a 25-year fade and stain warranty (find out more at www.trex.com/warranty) with six colors to choose from Tree House, Vintage Lantern, Gravel Path, Fire Pit, and their Tropical streaked hardwood colors Spiced Rum and Lava Rock. Transcend decking pairs perfectly with the Transcend Railing selection in six great colors of Tree House, Vintage Lantern, Gravel Path, Firepit, Charcoal Black and Classic White. Transcend is easy clean – just soap and water. Enjoy a seamless, smooth finish with Trex Hideaway Hidden Fasteners. View their entire line at Trex.com. Trex Elevations Steel Framing is made of galvanized steel with a bronze colored powder coating. It is non-combustible, termite-proof and rust-resistant. To protect your investment Trex Elevation is backed by a 25-year limited residential warranty. Trex RainEscape is an under-deck drainage system that uses a network of troughs and downspout construction to keep rain, spills and snow melt from dripping through elevated deck boards. 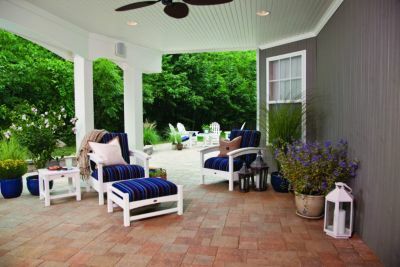 Creating a dry space beneath the deck allows homeowners to create an outdoor living area by installing lights, ceiling fans, entertainment systems, outdoor kitchens and more. If you are interested in a Trex composite deck, experience our Trex Color Visualizer tool! Choose a design. Select the accents. View the color options. Then call us at 630-420-1940 for an honest, no-hassle estimate. Use our Trex Color Visualizer Tool. Request a FREE Estimate! Call 630-420-1940 or contact us for a quote.